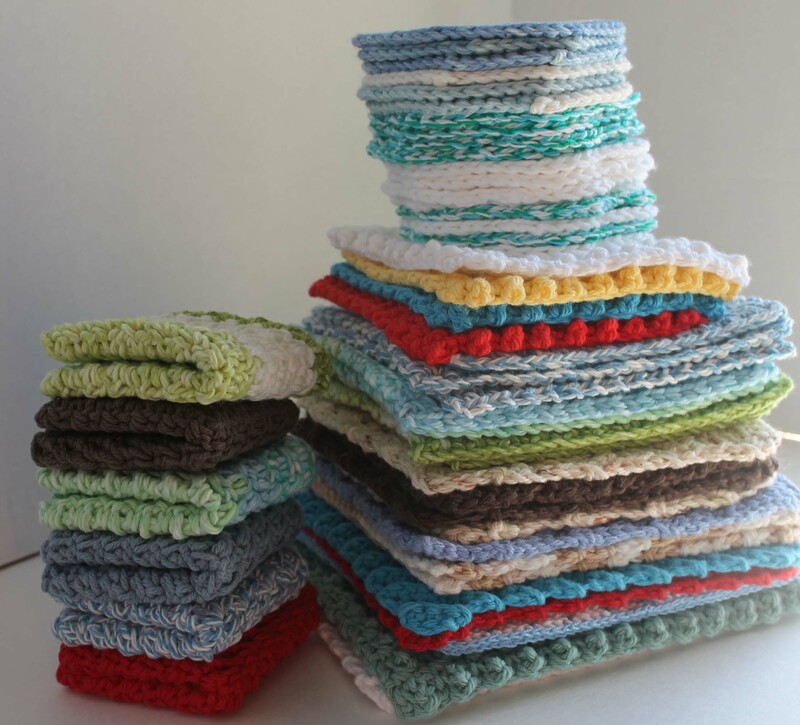 Whether they are crocheted or knitted, handmade dish cloths are a joy to have in the house, apartment, dorm or work. People I know prefer these to the thin store bought type. On the practical side, they are absorbent and quite useful for sopping up spills. The same thing that’s true of sponges is true of cotton dish cloths: a damp one absorbs more than a dry one. That may seem counter intuitive, but it’s true. Not to mention eco-friendly when compared against paper towels. Cotton cloths can be used in any room, from the kitchen to the bathroom – even in the garage. Sure they’re pretty, but they are strong and durable too. On the cute side, Handmade Dish Cloths are adorable when matched with serving pieces or when used as potholders or tea towels. Create a pretty display in the bathroom with matching soaps. Wash/Bath Cloths – They scrub fairly well because of the texture, but are not scratchy or rough. Dish Cloths – Use them on nonstick pans for scrubbing off baked-on stuff when you can’t use a Brillo pad. Dusting Cloths – Use with or without furniture polish without fear of scratching your wooden surfaces. Use them as hot pads, as pot holders and decoratively on the counter under any pretty bowl. Dishcloths do need to be “broken in” – 100% cotton really needs to be washed a lot before it mops up instead of just pushes water around. Just as with the micro fiber cloths, never use liquid softener on your towels because it decreases their absorbency. Do you have a collection of hand made dish cloths? Share your story here.